Is your "double chin" getting in the way of a good selfie? Double chins are a very common condition that affects both men and women. Stubborn fat beneath the chin is often resistant to diet and exercise alone. KYBELLA® is the first and only FDA-approved injectable treatment used in adults to improve the appearance of moderate to severe fat below the chin, also called "submental fat." Treatments with Kybella at Hedden & Gunn Plastic Surgery destroy the fat cells that create a double chin to give your lower face, chin and neck a more youthful and contoured profile. 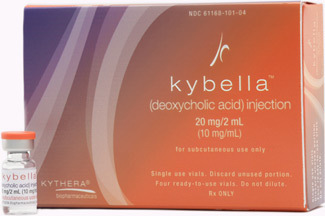 Kybella's active ingredient is deoxycholic acid, which is naturally produced by the body and helps you absorb fat. Fat cleared from the treatment area is processed through the body's natural metabolism. A broad range of adults are affected by submental fullness, or the appearance of a double chin. Submental fullness is influenced by aging, weight gain and genetic predisposition. Chin fat can be very difficult to get rid of on your own, even for people who eat well and get regular exercise. A 2015 survey conducted by the American Society for Dermatologic Surgery found that aesthetically-oriented consumers were as concerned with excess under-the-chin fat as they were with lines and wrinkles around the eyes. Kybella improves the appearance of fat below the chin by physically destroying fat cells in the submental area beneath the skin. Once these stubborn fat cells are destroyed, they can no longer store or accumulate fat. Non-surgical Kybella treatments at Hedden & Gunn Plastic Surgery are performed during an office visit to our Birmingham, Alabama cosmetic center. During treatment sessions, which may take from 15 to 20 minutes, Kybella is delivered into the fat below your chin with a series of injections from a tiny needle. The injection destroys the membranes of the fat cells, after which the fat is naturally processed by the body. During your complimentary consultation at Hedden & Gunn Plastic Surgery, a customized treatment plan is created based on the amount and distribution of your submental fat and your personal treatment goals. Many patients see visible results with two to four Kybella treatments, while up to six treatments may be administered at least 1 month apart. Retreatment is not expected once you have achieved your desired aesthetic result. In clinical studies, 79% of people treated with Kybella had improved satisfaction with the appearance of the area beneath their chin 12 weeks after their last treatment. Following treatment with Kybella, you are likely to have some swelling. Ice or a cold pack will be applied to the treatment area for 10 to 15 minutes, as needed. Downtime was found to occur most commonly after the first treatment session. Until recently, people who considered cosmetic surgery to reduce under-the-chin fat were left to choose between surgical procedures such as neck liposuction or a neck lift. Now, Kybella Double Chin treatment and the CoolSculpting CoolMini are available for non-invasive fat reduction in the submental area beneath the chin. Injections with KYBELLA are the new, non-invasive way to reduce the fat that causes double chins to give your chin and face a contoured, youthful look.